This is the second of a two-part piece about the storied Mille Miglia Race- the exhibition of speed and machinery, the most important auto-cross event in the world, and the Chopard watch that bears its name. 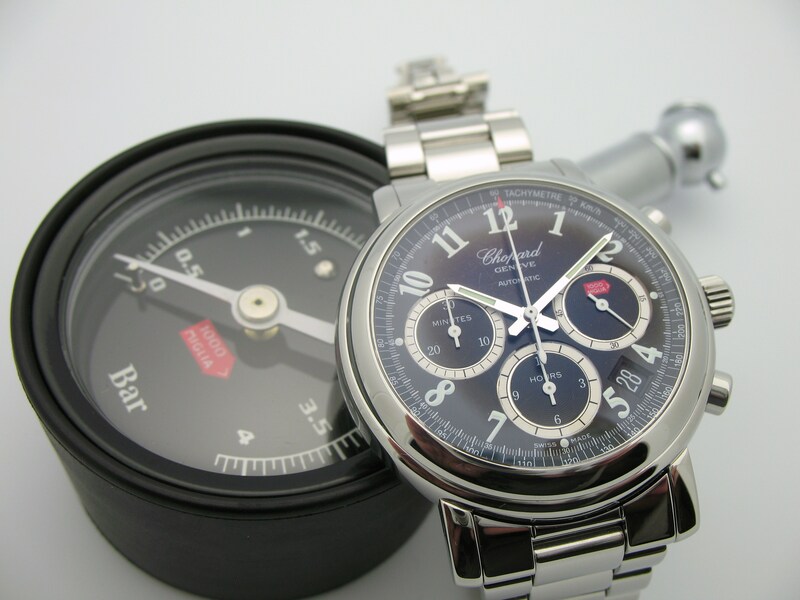 The Chopard Mille Miglia Chronograph. Chopard is a Swiss-based luxury watch, jewelry, and Accessories Company founded in 1860 by Louis-Ulysse Chopard. Chopard initially concentrated on developing precision pocket watches and chronometers. 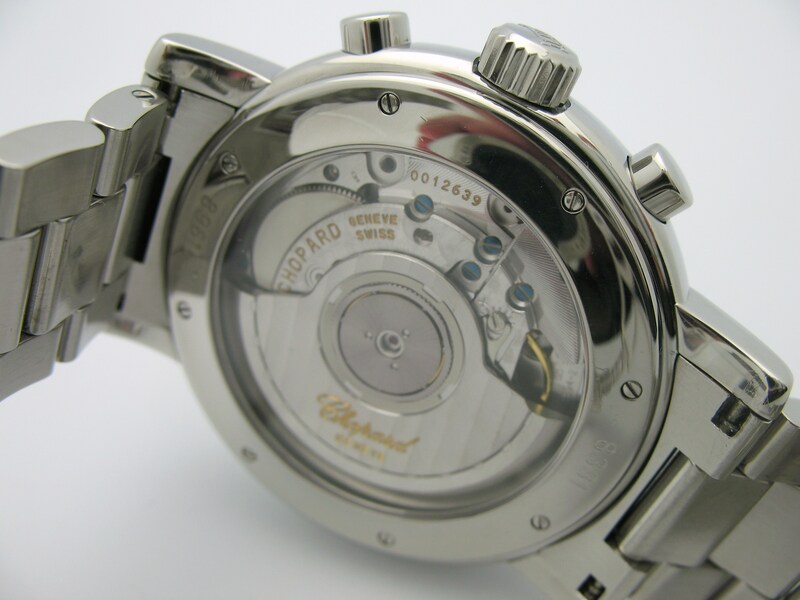 Chopard is regarded as a manufacture, in other words that they make many of their watches and movements in-house rather than using the base movements (ebauches) of other manufacturers. Chopard has designed this particular watch and releases it as a limited edition every year. I recently acquired one and decided to review it because it is a fantastic piece. The Chopard Mille Miglia watch is designed in the spirit of racing, and this series does not hold back when making racing the prominent theme. Available in men’s and ladies and crafted in stainless steel or solid gold, this series is versatile enough to accommodate any taste. They are automatic timepieces featuring a chronograph, dual time zone GMT, and power reserve indicators in the guise of a fuel gage. Certain models are available with rubber straps designed as tire treads, while others, such as the Gran Turismo are adorned with a classy leather strap. Highly functional and at the forefront of style, the Mille Miglia series of Chopard watches is a dedicated tribute to racing and a bold timepiece meant to attest to the wearers passion in any setting. The model here is the 8331 Chronograph. 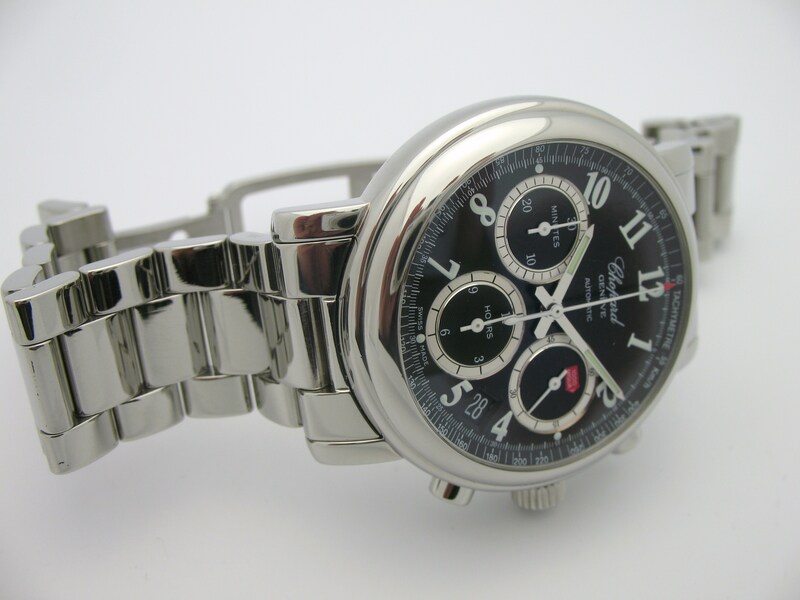 It is a beautiful tachymeter meant for doing one function-measuring speed. It is available with and extremely well fitted and comfortable stainless steel bracelet or a tire tread rubber strap in homage to its inspiration. The dial is simple and easy to read despite its chronograph functions and is emblazoned with the 1000 mile image; it has very bright luminous indicators, and a nice smooth texture. 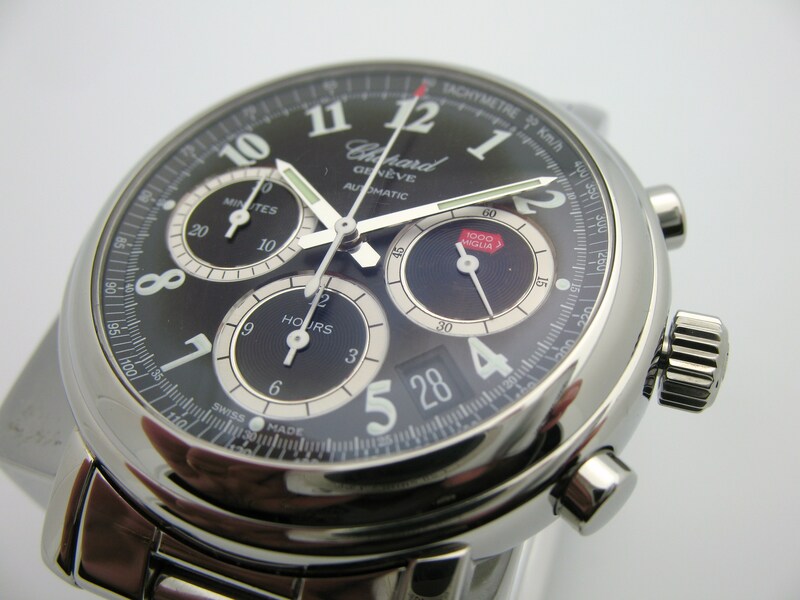 The movement is a 31 jewel automatic chronograph with a 46 hour reserve, and it is a COSC certified chronometer. The movement is ultra smooth, the second hand marches with nary a jump thanks to a 28,800 bph speed. The pushers click precisely and reset without a sound. And you can view it all through the exhibition back with another sapphire crystal. It comes in a nice presentation box, and with one more tip of the hat to its racing heritage, a tire guage. I really enjoy this watch, and I encourage you to try one out, because whether you are a car guy, or a watch guy, or both, you’ll find this timepiece to be swell. 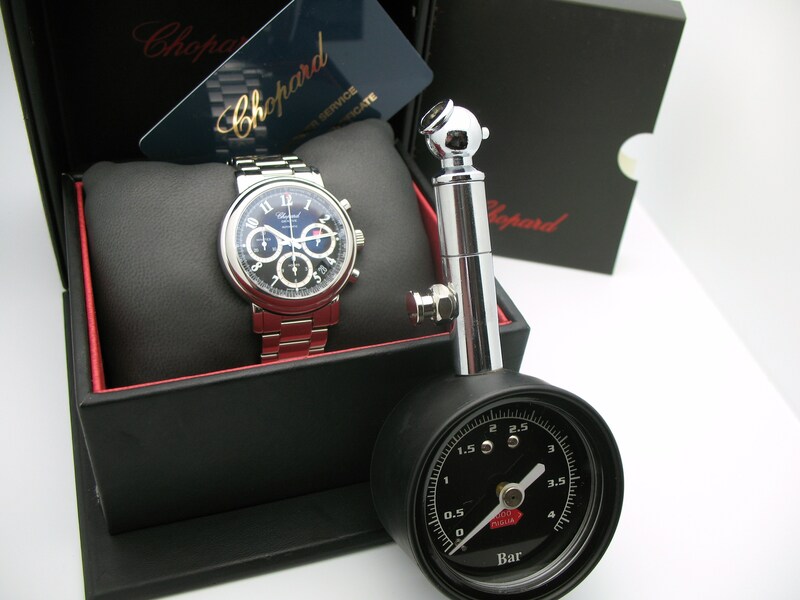 This entry was posted in Chopard, Watches, What to see and tagged Auto racing, Chopard, COSC, Jaguar C-Type, Jewelry, jewelry watch, Louis-Ulysse Chopard, Mille Miglia, Shopping, Stainless steel, Stirling Moss, Swiss, Watch, Watches. Bookmark the permalink.